DOMUPLUS is made by a proprietary technology that simplify electrical installation and improve the use of your space. Simple installation, reliable technology, it is NOT X10 and then remove the need for additional wires...with a range of impressive advantages! There is No need to insert noise filters on power line !!! Domuplus enable one light to be controlled from more than one position. Domuplus enable more than one light to be controlled from one position. The DOMUPLUS is the innovative solution which use existing wiring – live and neutral wires only – completely easy installation in just a few short steps. The mark indicates conformity to the legal requirements of the European Union (EU) Directive with respect to safety, health, environment, and consumer protection. Domuplus devices provide solutions for lighting/electrical installation in domestic properties. They are customizable versatile and suitable for new construction or renovation. 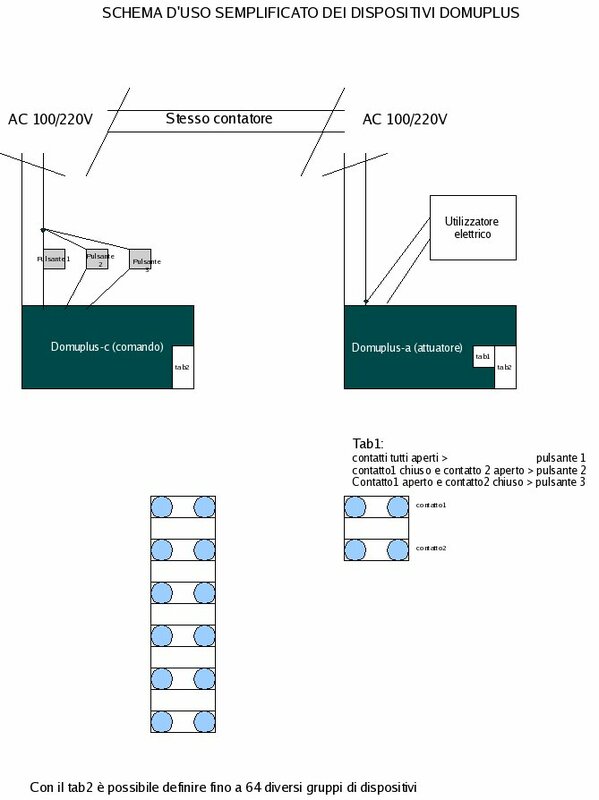 The DOMUPLUS control devices must be connected to the command devices, like momentary push switches, switches, relay, etc. . The DOMUPLUS actuator devices must be connected to the electrical load.